"You can't change the ideas of an old man, can you?" Everything, it seems, even the eternal fate of your soul, comes down to real estate. This quiet documentary is about one man's quest to establish his legacy while in his twilight years, and it's a frequently affecting character study. It can feel a little thin, though, and even at under an hour and a half, soon starts to feel as if it is wearing out its welcome. The focus of the film is on Mr. Vig, a devout Dane in his 80s, who owns a castle�but what once may have been grand is now dilapidated and in tremendous disrepair, and Vig wants to do something about that. He offers the building and its land to the Russian Orthodox Church, in the hope that the Church will establish a monastery on the site�and he's taken up on his offer, and an official scouting party of sorts is dispatched from Russia to survey the promised gift. 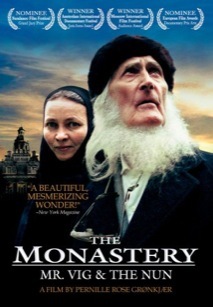 The principal relationship in the film, then, is between Vig and Sister Amvrosija, the chief of the Church's delegation, as Vig, his neighbors and the Russians attempt to get the place into proper working order. Principally this is a look at Vig, and there's an unquestionable poignancy to him�he clearly harbors some sort of secret dream of his home becoming a thriving center of religious activity, and he ruefully discusses his own history, one of emotional distance from his parents and, apparently, everyone else. You can see why the documentarians would be interested in Vig, and not just for his selflessness�he's a flinty old coot with his great unkempt white hair and mad beard, and has the recluse's inability to compromise, which leads to him and the sister knocking heads. But his emotional life particularly is so inaccessible, and so much of the film is about patching roofs and fixing boilers, that it starts to feel like a misguided fixer-upper show, This Old Russian Orthodox House, or something. Women especially are eternally baffling to Vig, and Sister Amvrosija only adds aggravation to his sense of mystery�the realization dawns that the road to his dream runs through this severe Russian religious, and that his hope for a thriving Church community on the site isn't going to be realized in his lifetime. So we do come to feel badly for the old fellow, and even develop an affection for him; but the ponderous tone of much of the piece can get a little tiresome, especially as the movie doesn't offer much in the way of narrative drive. Image Transfer Review: Kind of a flat transfer, that does no favors to some of the problematically lit footage; lots of it looks scratchy and overly grainy. Audio Transfer Review: One of the most interesting incidental things about the movie is that the Danes and the Russians communicate with one another in English, though it's heavily accented and they frequently slip into their native tongue; it's all subtitled, which is a blessing, as it can be a strain to decipher much of it. Extras Review: A package (05m:50s) of five deleted scenes focuses almost exclusively on wacky home repair. An intriguing character study of a man attending to final things, but rather too small and ponderous to sustain one's attention.